Observation - Uroleucon tanaceti? - UK and Ireland. Description: Blood-red aphids on undersides of leaves of Camphor Daisy (Tanacetum balsamita subsp. balsamitoides). 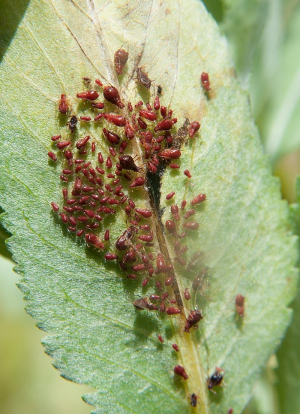 Blood-red aphids on undersides of leaves of Camphor Daisy (Tanacetum balsamita subsp. balsamitoides).